The Panama Pacific Exposition was held in San Francisco, California in 1915 to commemorate the opening of the Panama Canal in 1915. A second reason for holding the fair was to celebrate the rebuilding of San Francisco after the 1906 earthquake. Click on the link at the right for more information about the Panama California Exposition. Uncle Jeremiah at the Panama Pacific Exposition - C. M. Stevens, Ph. D.
The Story of a Great Achievement - American Telephone and Telegraph Co.
California in 1915 - Raymond & Whitcomb Co.
Condensed Facts Concerning the Panama-Pacific Universal Exposition - San Francisco 1915 - Celebrating the Opening of the Panama Canal. The Panama Canal at San Francisco 1915 - Panama Canal Exhibition Co. 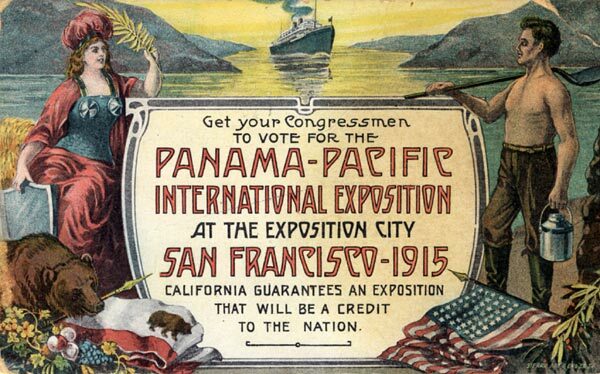 The Peoples Easy Guide to the Panama-Pacific International Exposition.